What is your Christmas dinner like at your house? It has been interesting to talk to my friends and find out what their holiday traditions are and what they eat on Chrismas eve and Christmas day. At my house we will be having a mix of Traditional French and American fare. We will start with Foie Gras, a salad of Belgium Endives with blue cheese crumbles and walnuts. Our main course will be made of Oven-Roasted Goose, Pomme de Terre Sarladaise ( Oven roasted Potatoes in Goose fat), French peas, Roasted Chestnuts, Creamy Sweet Potato Casserole, and Cranberry Relish. To finish this festive meal, we will have a cheese platter with assorted jam ( figs, dark cherry..) and of course the traditional Buche de Noel ( Yule Log) and mignardises ( small cookies and pastries such as miniatures madeleines, macarons…). How does this sound? A bit much, I hear you say;-)… Well we only celebrate Christmas once a year so we may as well enjoy it, right?!?! Today I will share with you the Cranberry Relish that I make. 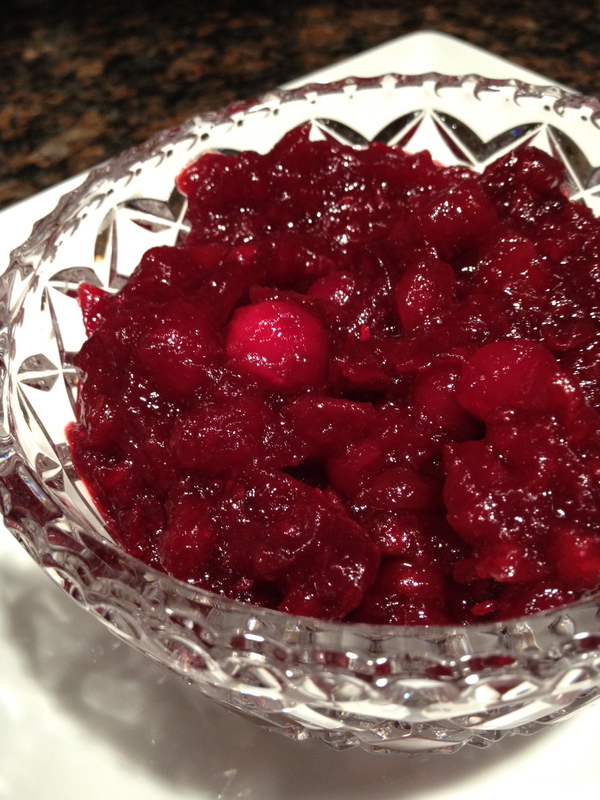 When I cooked my first cranberry relish, I used a traditional cranberry relish. Over the years the traditional recipe that I followed evolved into what it is today. It is slightly different from what most people make, but you will not disappointed if you tried mine. It has become a staple at my house. Ingredients: 1 pack of cranberry. 3/4 cup of brown sugar, 1/2 cup of red wine, 1 inch of grated fresh ginger, the orange zest of one orange, the juice of 1/2 orange, 1/2 cup of walnuts. Place all the ingredients beside the walnuts into a small saucepan and cook stirring constantly. Using a potato masher, pop the cranberries and cook for 10-15 minutes. The mixture will thicken. You may add chopped walnuts into the mixture before serving. Et voila!! !